The purest gems lie hidden in the bottom of the ocean or in the depth of rocks. One has to dive into the ocean or delve into the rocks to find them out. 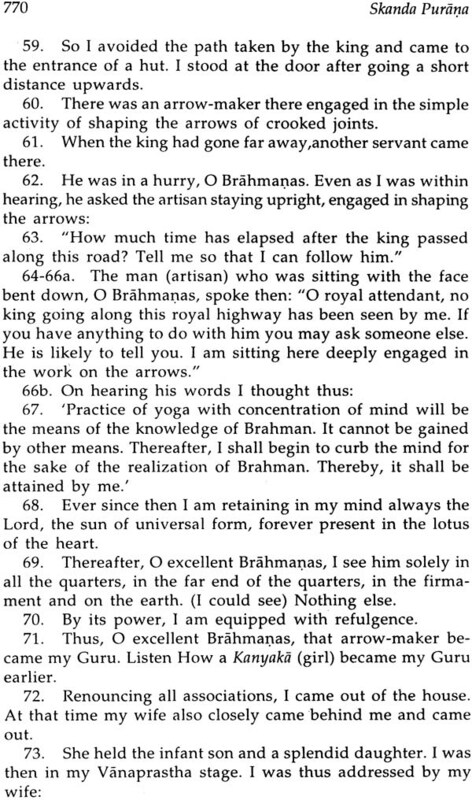 Similarly truth lies concealed in the language which with the passage of time has become obsolete. 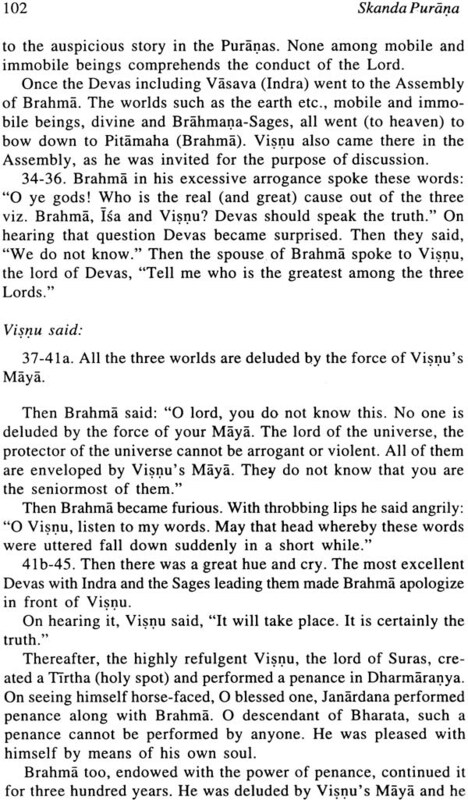 Man has to learn that language before he discovers that truth. 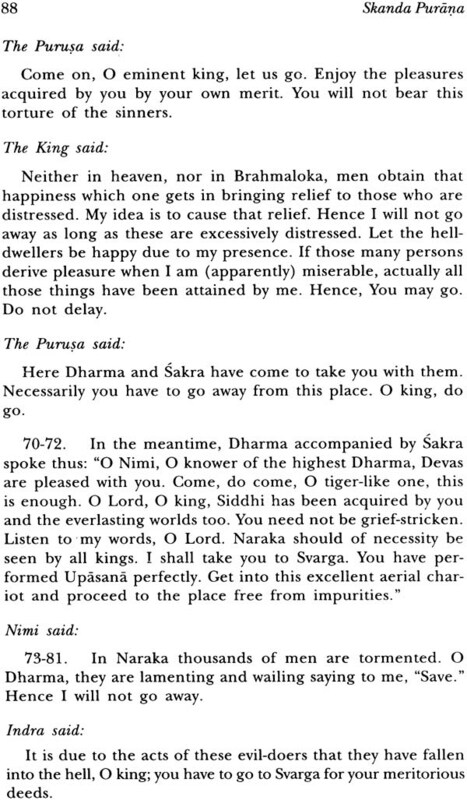 But he has neither the means nor the leisure to embark on that course. 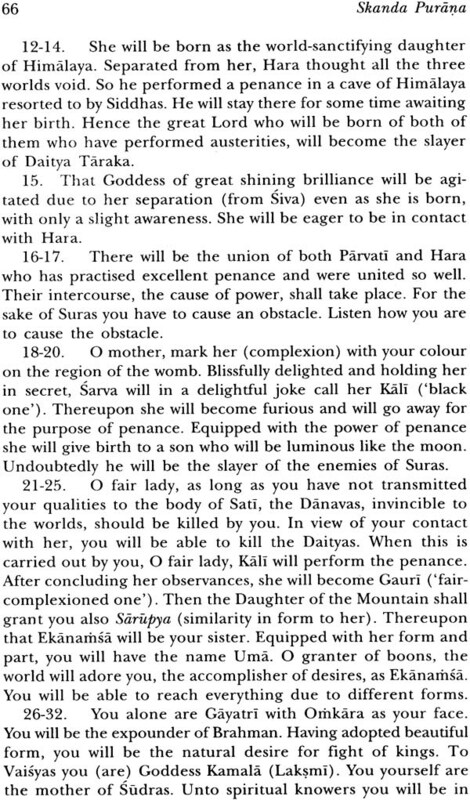 We have therefore planned to help him acquire knowledge by an easier course. 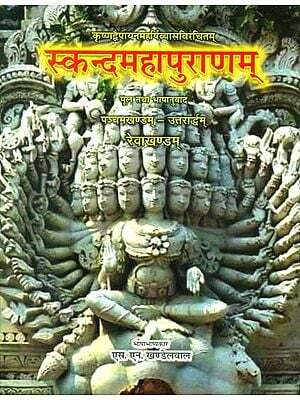 We have started the series of Ancient indian tradition and mythology in English translation. 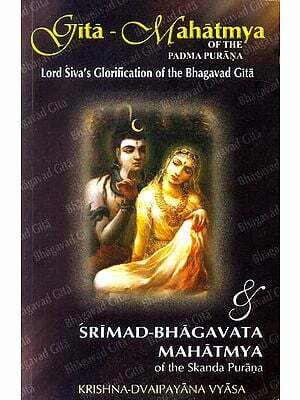 Our goal to universalize knowledge through the most popular international medium of expression. 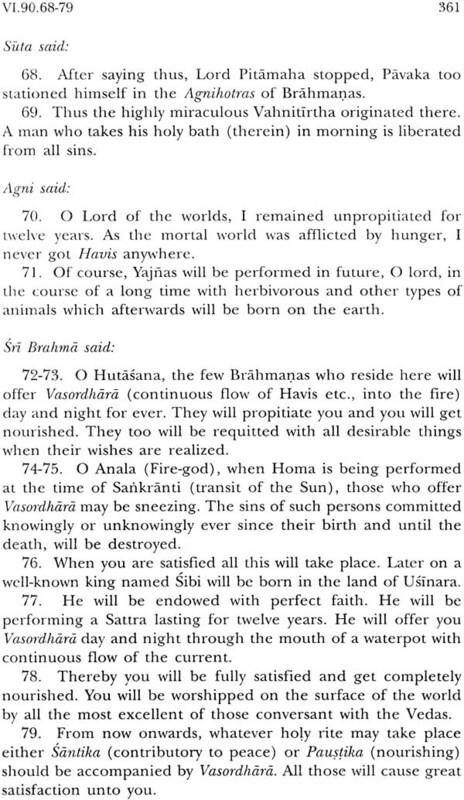 The publication of the puranas in English translation is a step towards that goal. 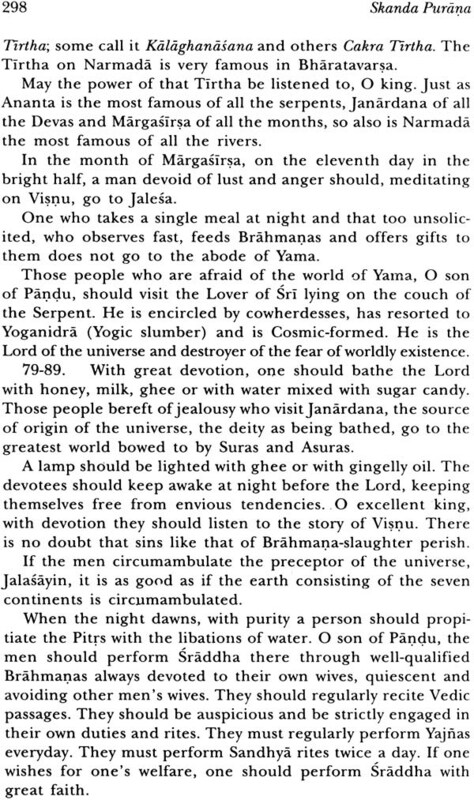 All religions be it islam Christianity or Hinduism lay great emphasis on the sanctity of certain places and enjoin pilgrimage to them. 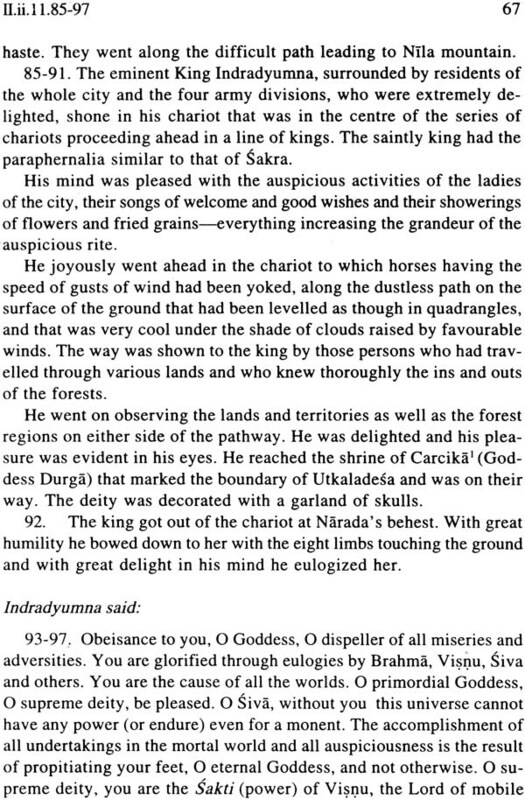 Large rivers mountains and forests have always been venerated as the abodes of gods. 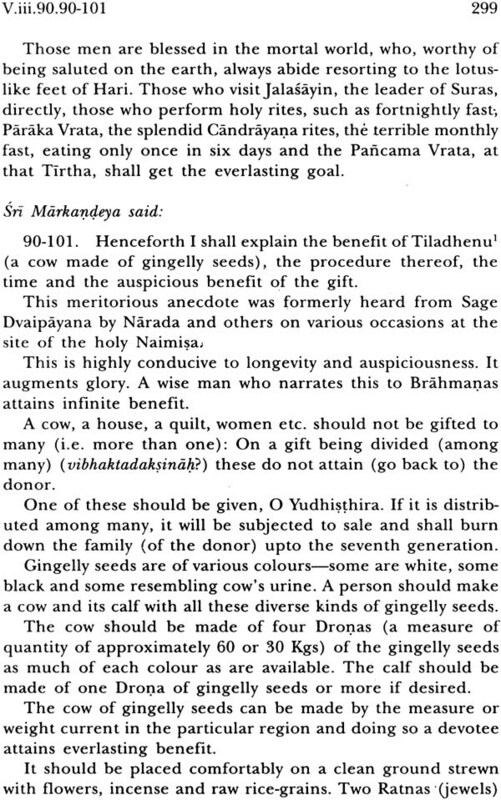 Ancient Sutras and old Smrtis like Manu and Yajnavalkya do not attach importance to Tirthas but the later literature on this branch of Dharmasastra is very extensive. 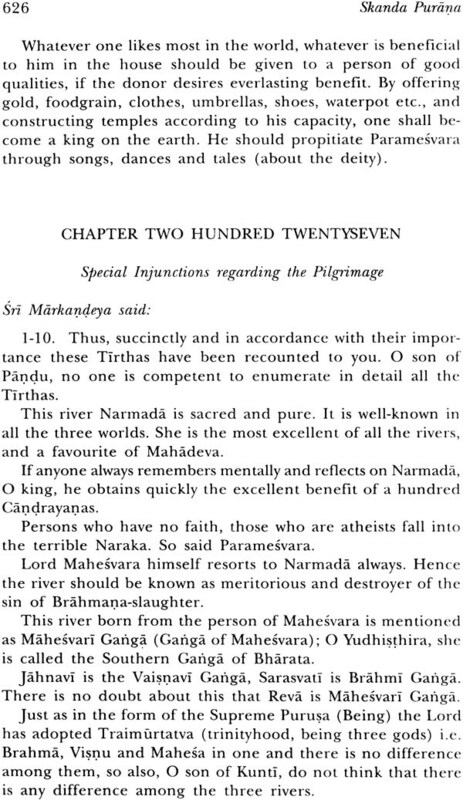 The Mahabharata regards pilgrimage to Tirthas more meritorious than sacrifices. 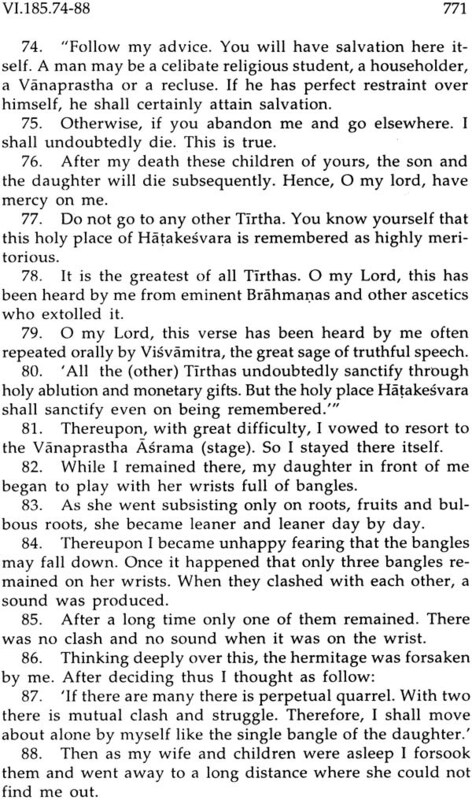 Hence it was natural that Puranas and digests on Tirthas vied with one another in glorifying their respective Tirthas. 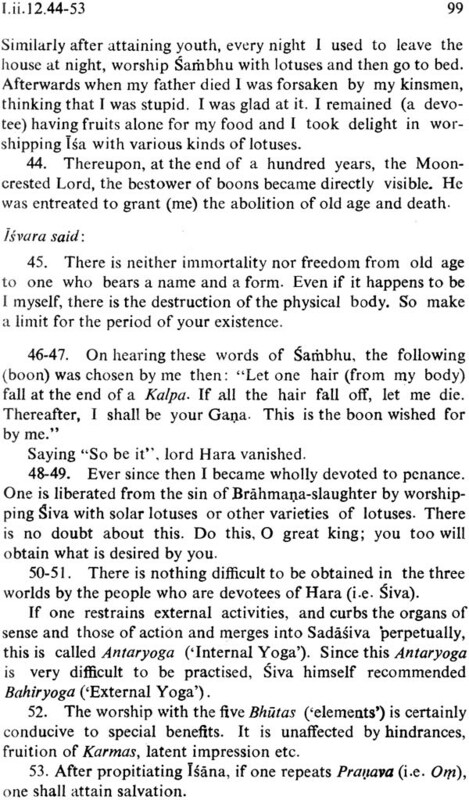 The Skanda Purana is not one book but a library of such Sthaal Puranas or Tirtha Mahatmyas. Hence its importance for researches in different disciplines. 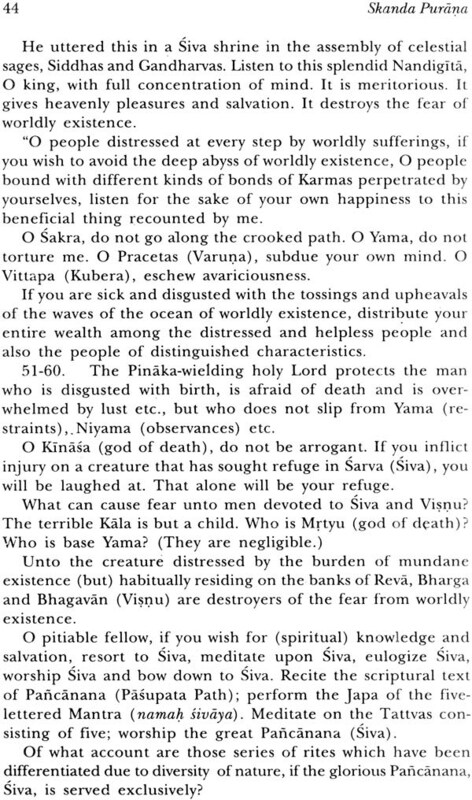 The great oriental scholar Dr. Jan Gonda has succinctly emphasized the importance of these sthala puranas in his Medieval religious literature in Sanskrit as follows. 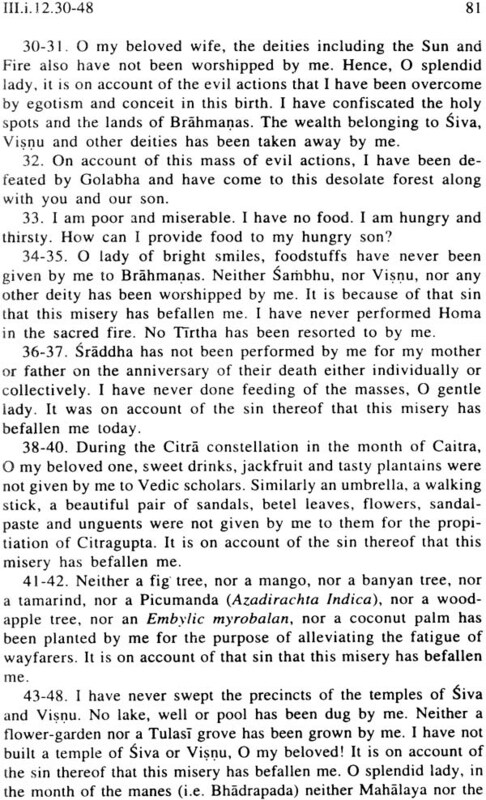 This genre of literature is not only very useful for deepening out knowledge of the cultural and religious history of india in general but also most valuable for those who want to reconstruct the development of regional history and local cults or to gain a deeper insight into various religious institutions for instance the recommendation of pilgrimage to poor people as a substitute for expensive sacrifice into beliefs and practices e.g. 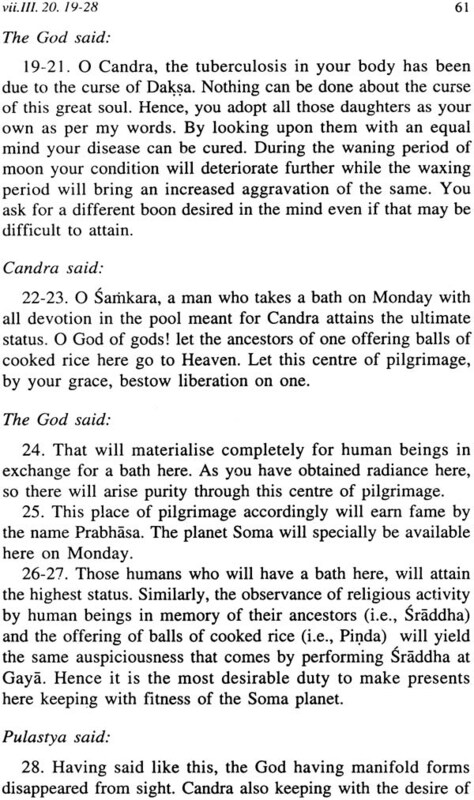 those who bathe here go to heaven and those who die here are not born again and in connection with the conviction in religious suicide and worship of the deceased and into the significance of holy places local variants of myths and legends and so on. They give information on topography. 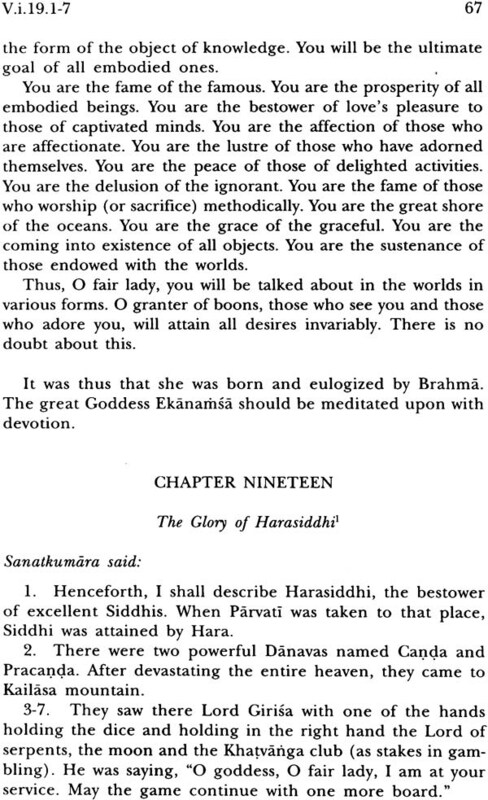 The Skp is thus a mine of social cultural political historical geographical religious and philosophical information. 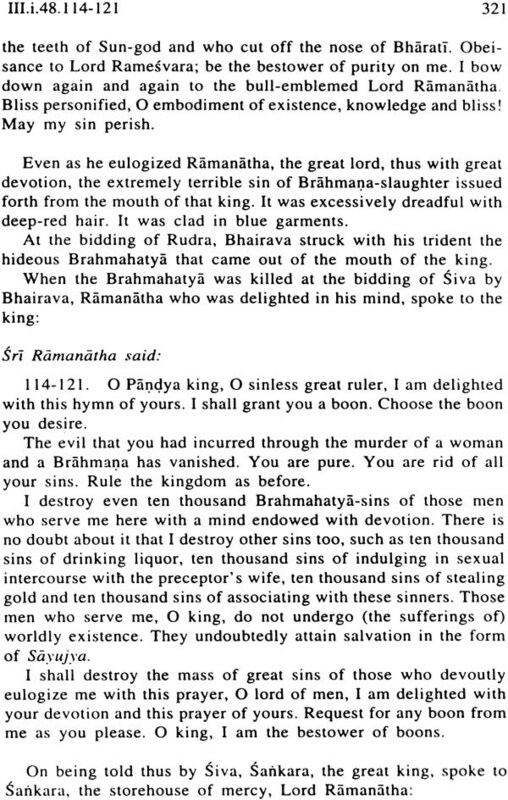 it need not however be supposed that the Skp or the Mbh underestimates the importance of moral purity. 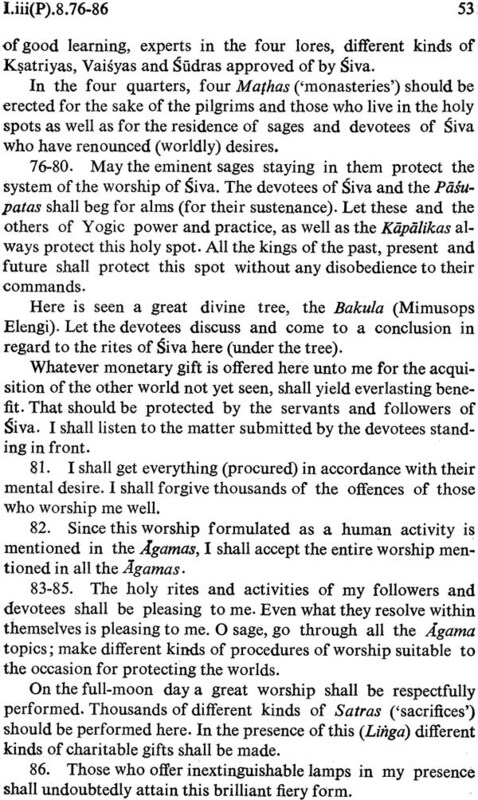 The Skp kasikhanda quotes Mbh vana 82.9-12 and exhorts the need of self control knowledge and penance for obtaining the full advantage of pilgrimage. 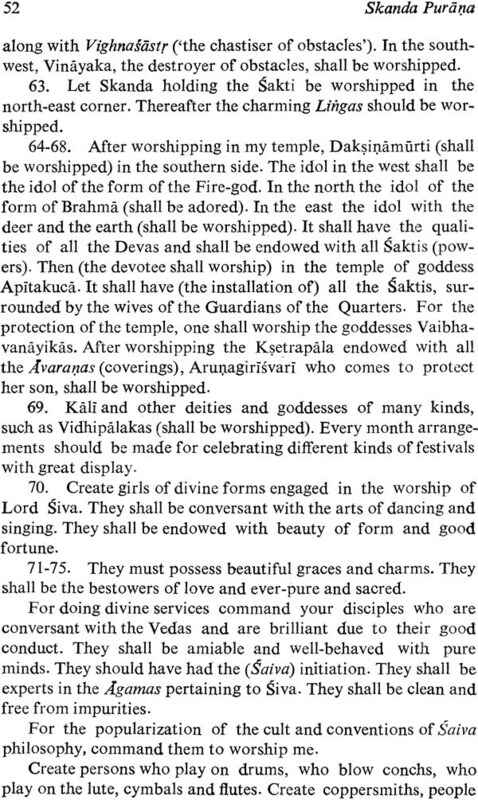 The Skp is specially important as it covers practically the whole of india. 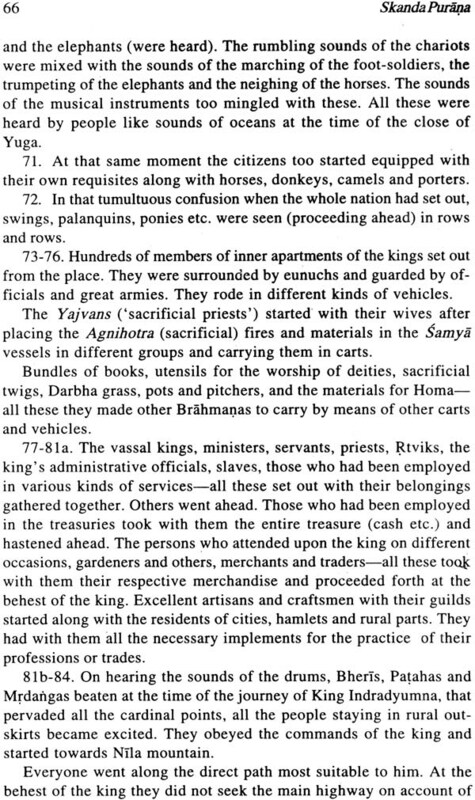 Thus it describes the topography cultural traditions etc. 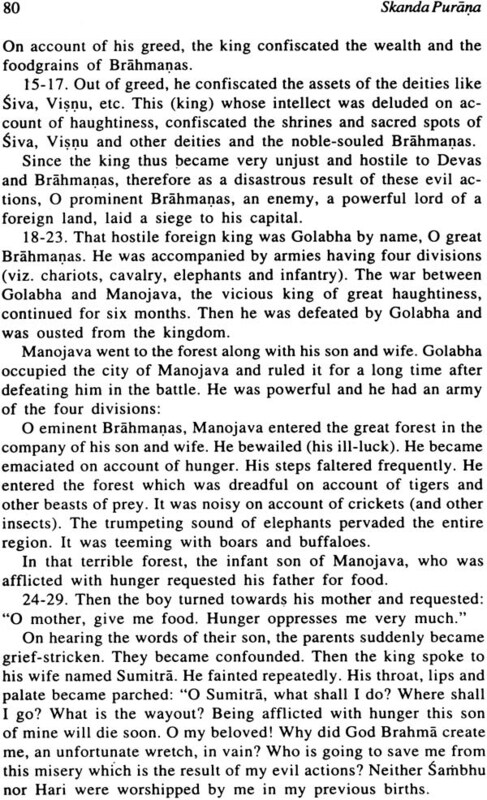 of the Himalayan region of Uttara Pradesh Orissa (in Purusottama ksetra-mahat-mya) Malwa Rajasthan and a part of Gujarat western india along with Gujarat and south india. 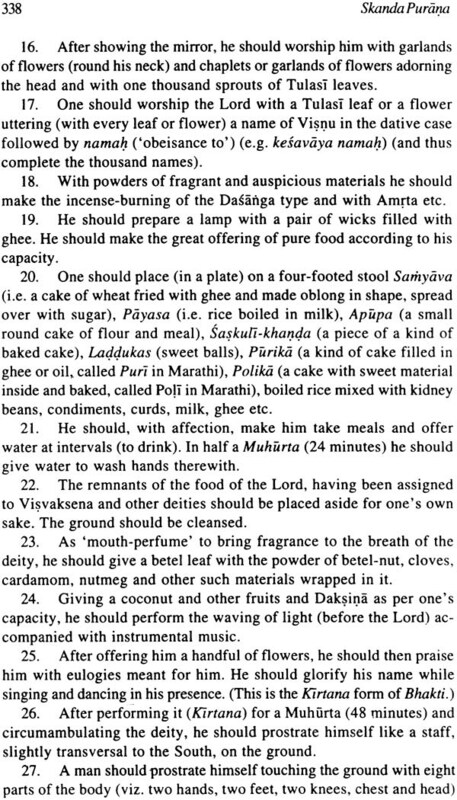 The Skp has thus covered the major part of india (except such states as maharashtra and Punjab). 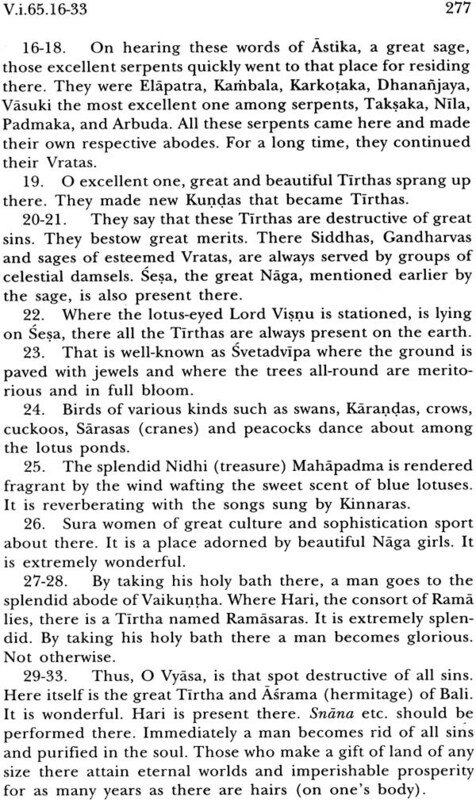 The authors of each of these Mahatmyas knew their respective regions like the palm of their hand and describe the topography of the area particular Tirtha its location legendary history its distance and directions from the main Tirtha. 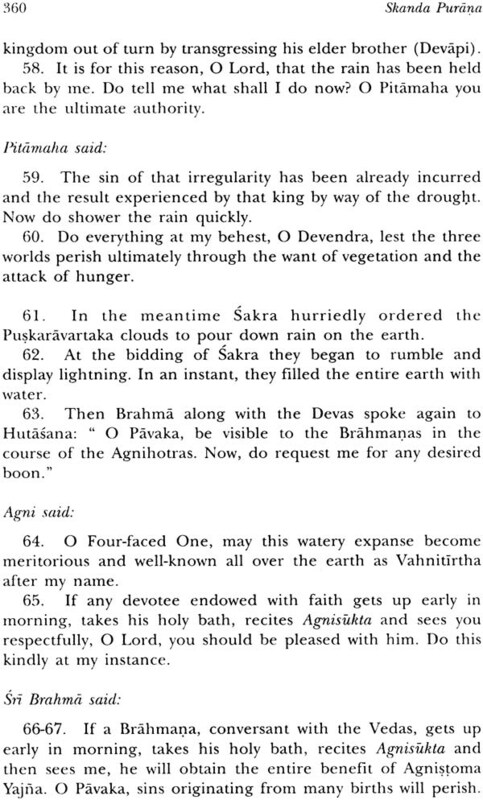 Naturally these Tirtha-mahata-myas came to be written at different times by different authors. 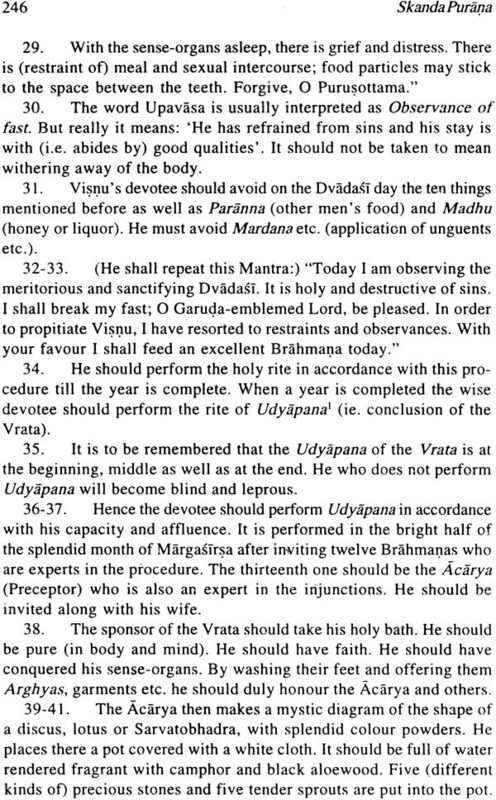 Hence the criticism or evaluation of a particular Khanda should not be regarded as applicable to the whole of the Skp thus the ignorance about the beginning of the kali age or the dates of Vikramaditya Saka, Pramati etc. 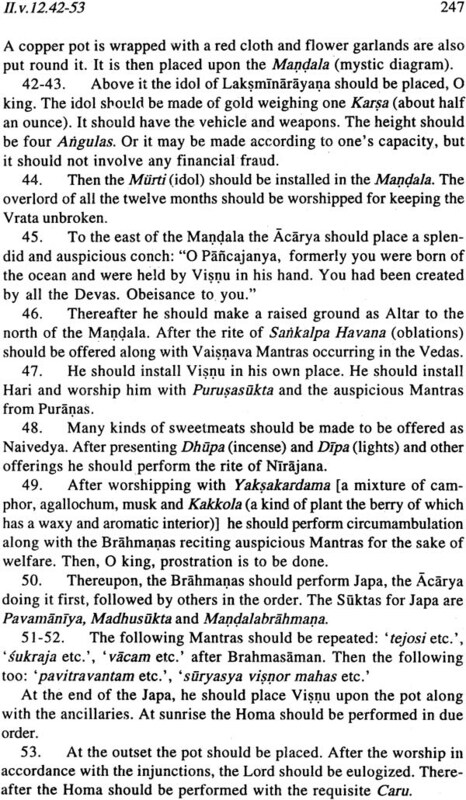 in Kaumarkakahanda should be attributed to the author of that particular khanda and not to authors of other parts. 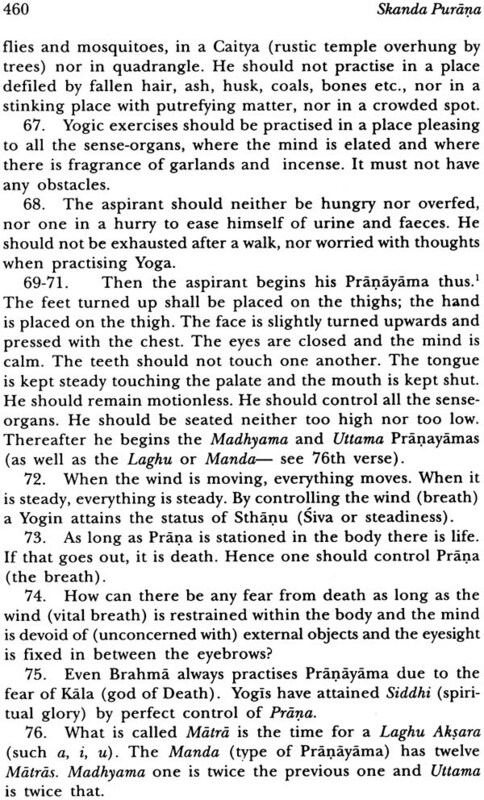 Similarly the author of the Kasikhanda does not mean that the whole of the Skp is of that poetic standard. 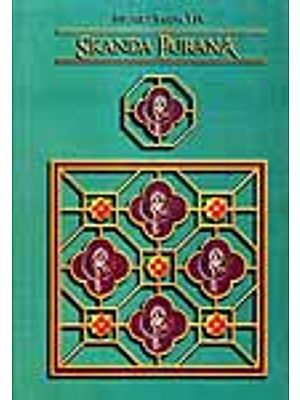 The general literary standard of other authors however is certainly high. 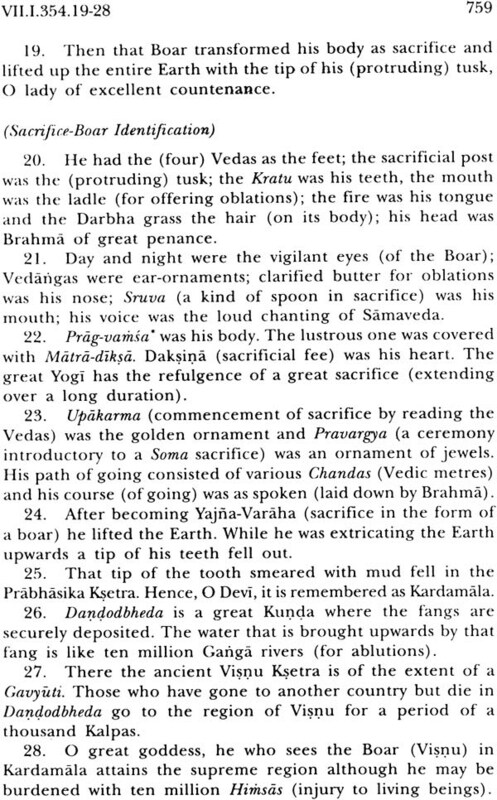 This Purana is called Skanda according to the NP 104.2-4 Vyasa this Purana Skanda and described it as consisting of a hundred thousand verses and all the rites and rituals regarding Siva have been revealed by Skanda. 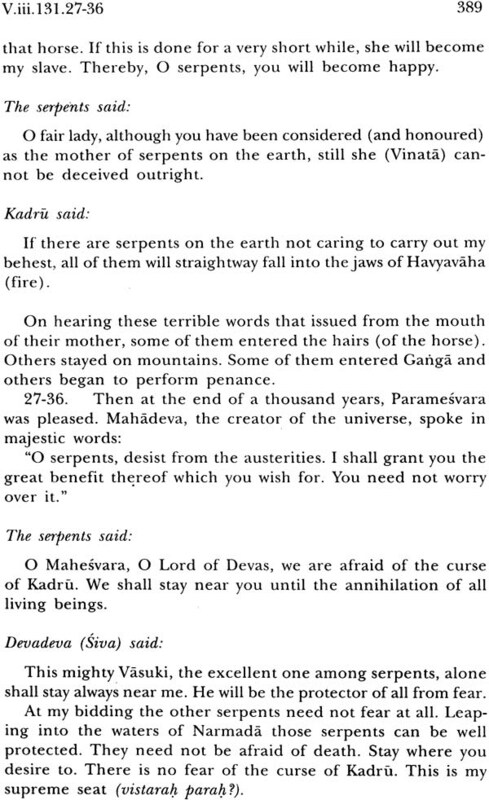 The Skp in the concluding (44th) Adhyaya of the last Khanda informs us. 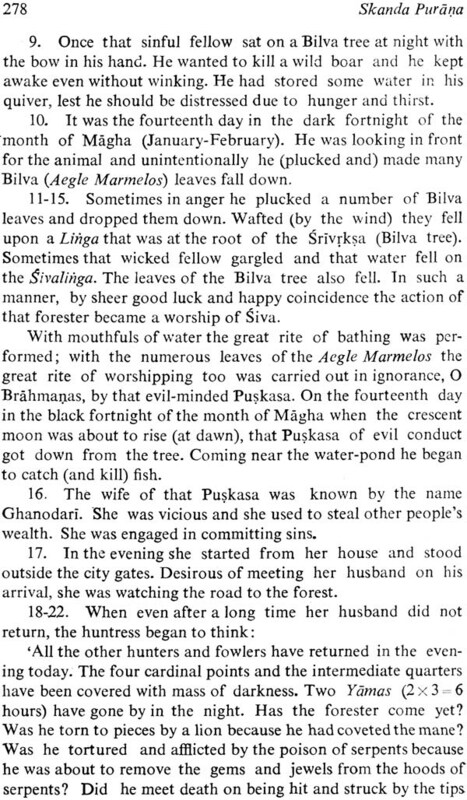 This skanda Purana was formerly disclosed by Kumara (skanda). 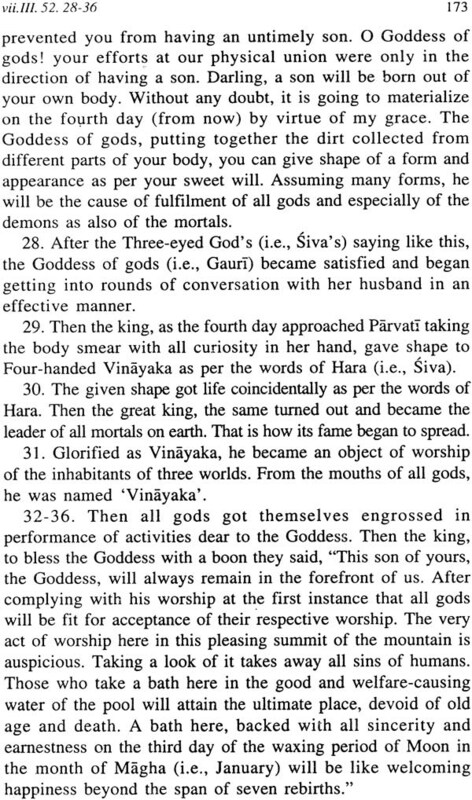 This Purana contributing to longevity and pleasing to the people of four Varnas was certainly created by the greatsouled Skanda. 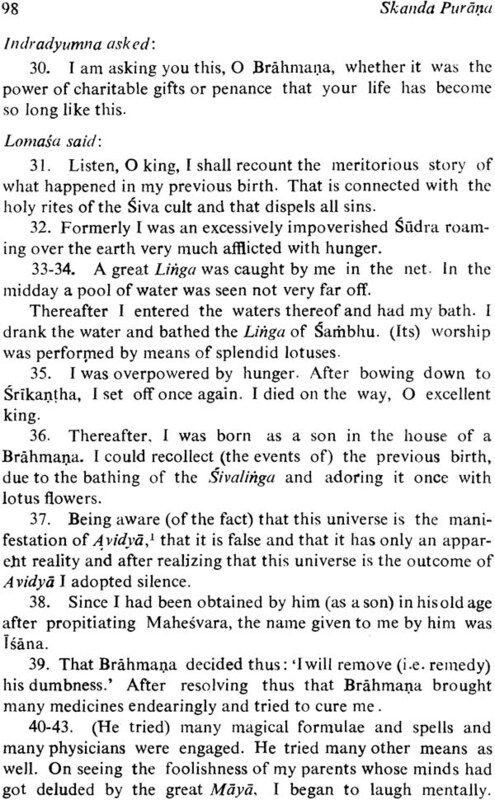 in the traditional list of Mahapuranas the Skp holds the thirteenth rank but in its extent in number of verses it is the first. 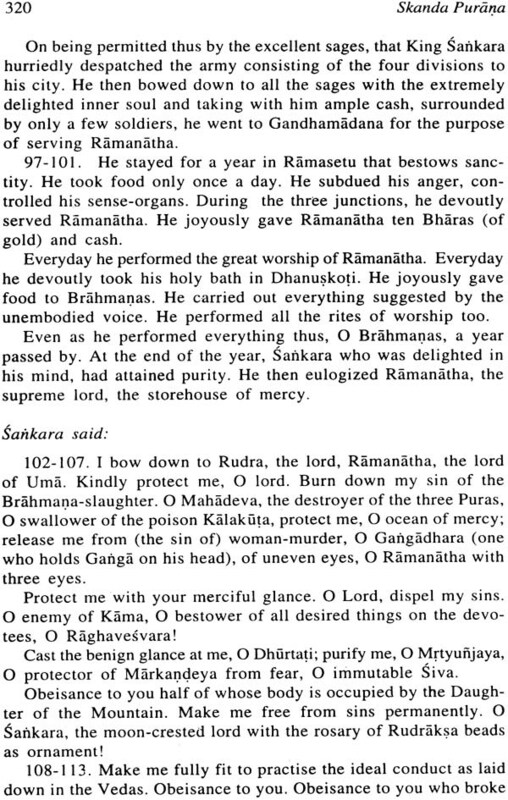 The Skp is found in two versions or forms (1)Khandas and (2) Samhitas the Samhitas are six in number viz ,(a) Sanatkumara (b) Suta (c) Sankari (d) Vaisnavi (e) Brahmi and (f) Saura the total number of verses in these Samhitas is one hundred thousand. 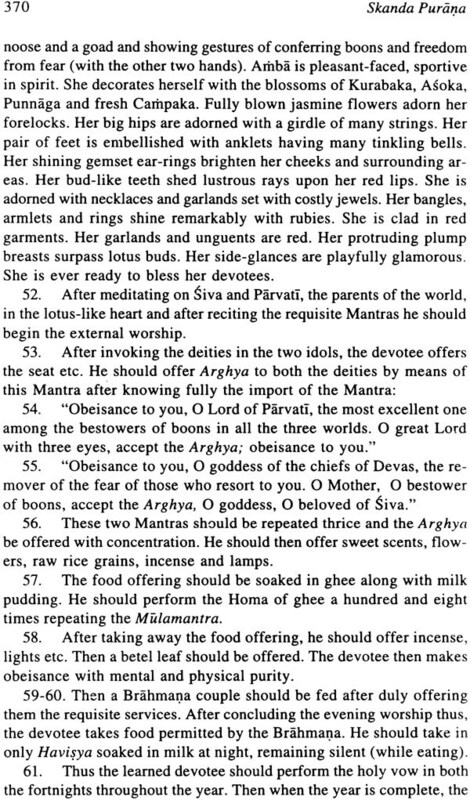 But the NP recognizes the Khanda version. 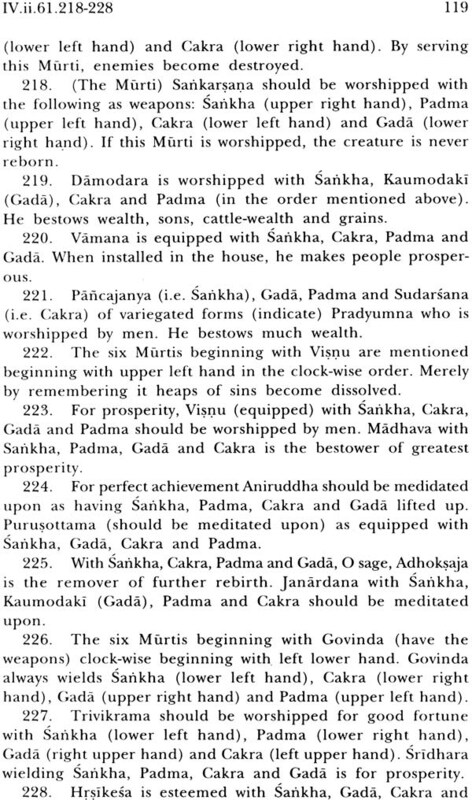 The Skp has the following seven khandas. 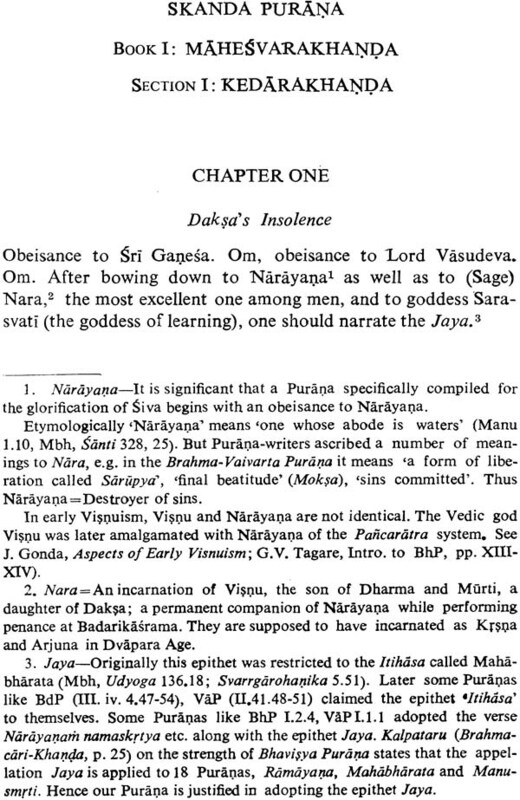 (1) Mahesvara (2) Vaisnava (3) Brahma (4) Kasi (5) Avanti (6) Nagara and (7) Prabhasa the NP 104.3 states that the Skp contains 81,000 verses a figure confirmed by the Skp in the colophon of each Adhyaya. 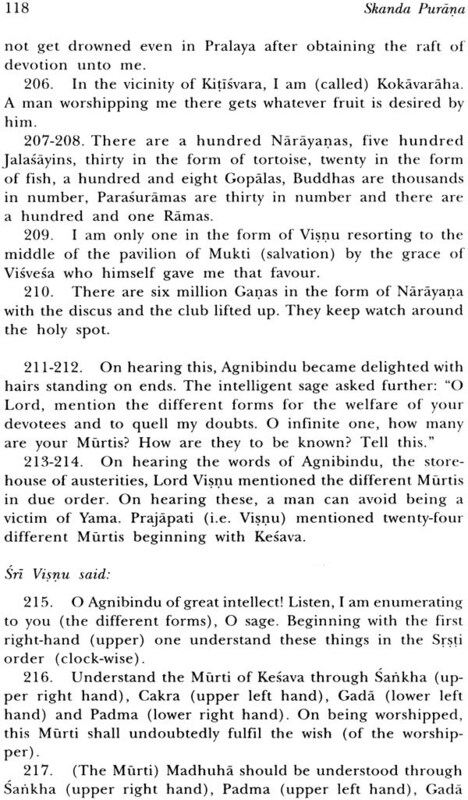 The Mtp 53.41-42 the Vap 104 and the Bhp 12,13 give 81,000 as the number of its verses. 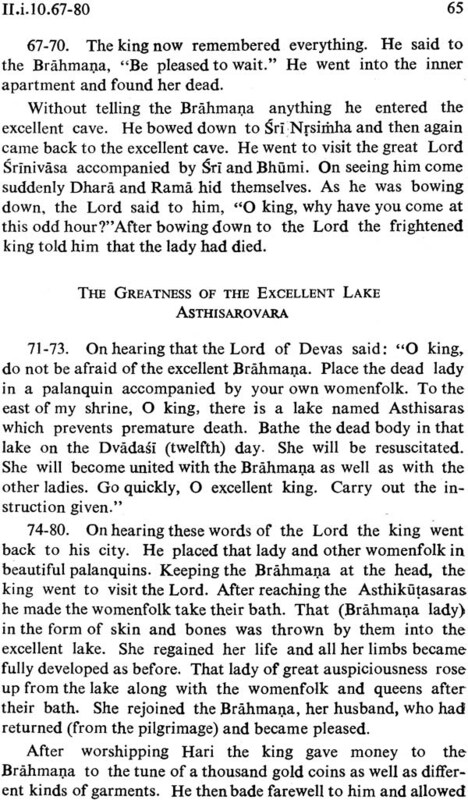 But the AP 272.17 states that the Skp has 84,000 verses a view confirmed by the Skp. 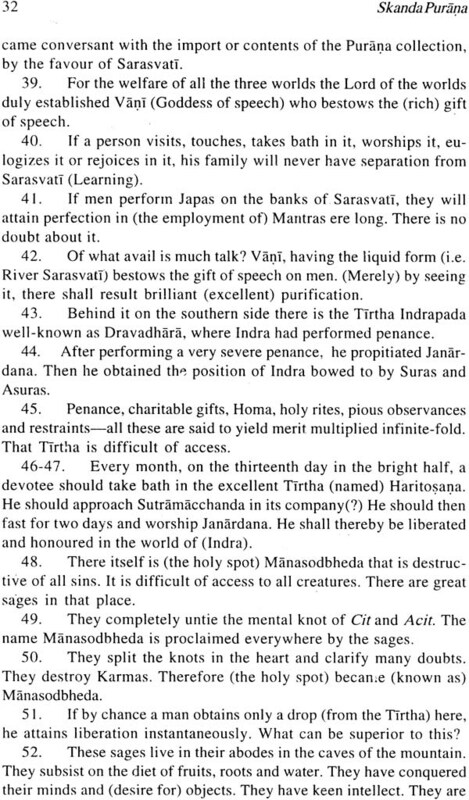 The Venkateshwar Press edition of the Skp which we translate contains 94313 verses. 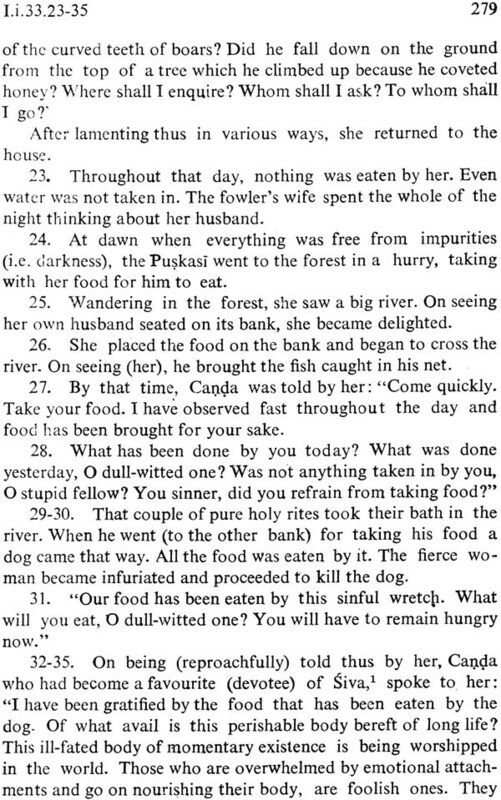 The incidents mentioned in this Purana took place in the Tatpurusa Kalpa. 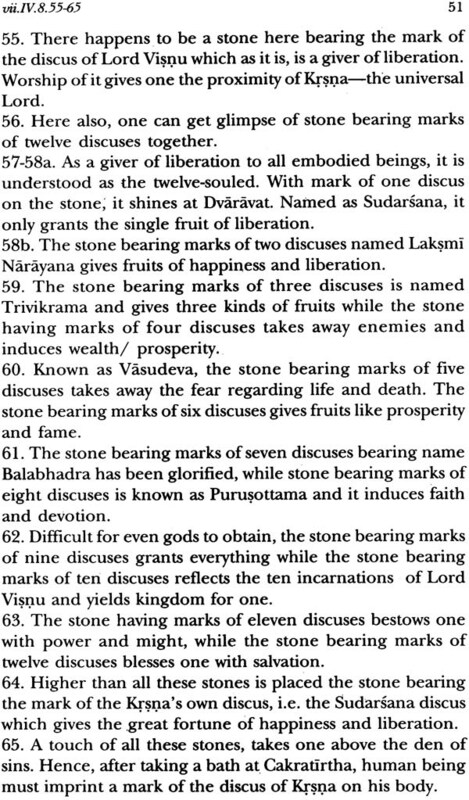 There are four editions of this Khanda type of Skp (1) the Venkateshwar Press (VP) (2) Bangavasi (BV) (3) Naval Kishore Press Lucknow and (4) the Gurumandala (GM) edition but these editions vary in their contents for ecample the catruastiti linga mahatmya in Part i of the Avanti Khanda is not found in the Lucknow edition. 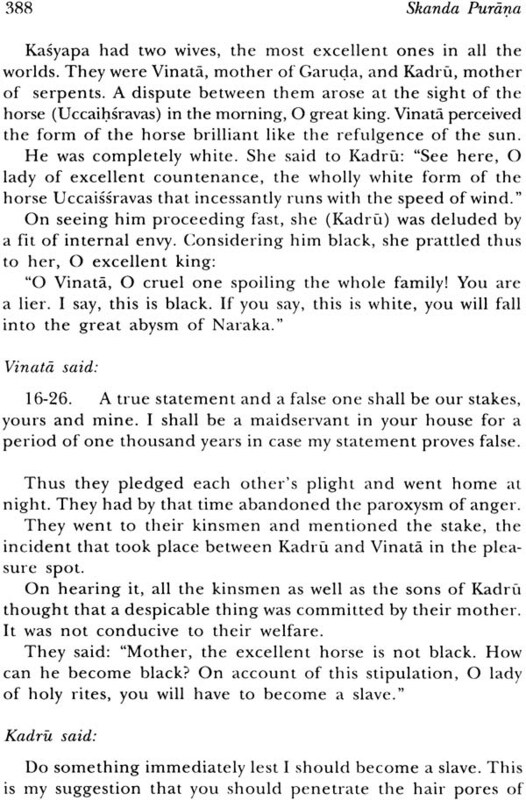 in Part ii of the Avanti Khanda some 110 chapters differ considerably from those in the VP edition. 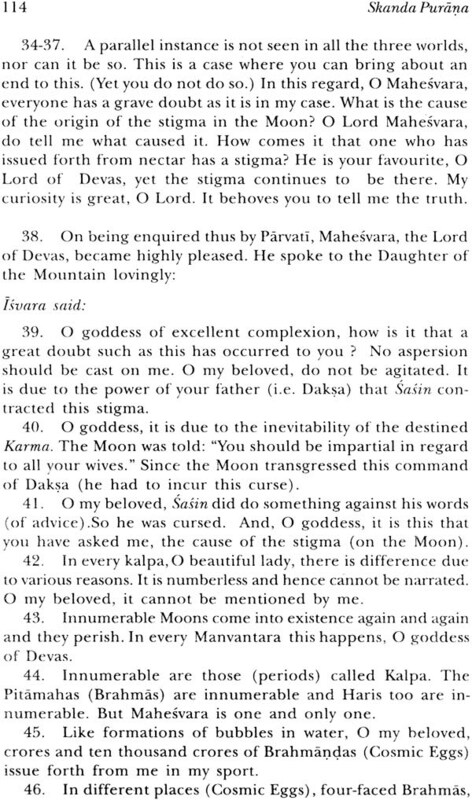 The GM includes the spurious Satya Narayana mahatmya in the Reva khanda but it is not found in the VP Edition. 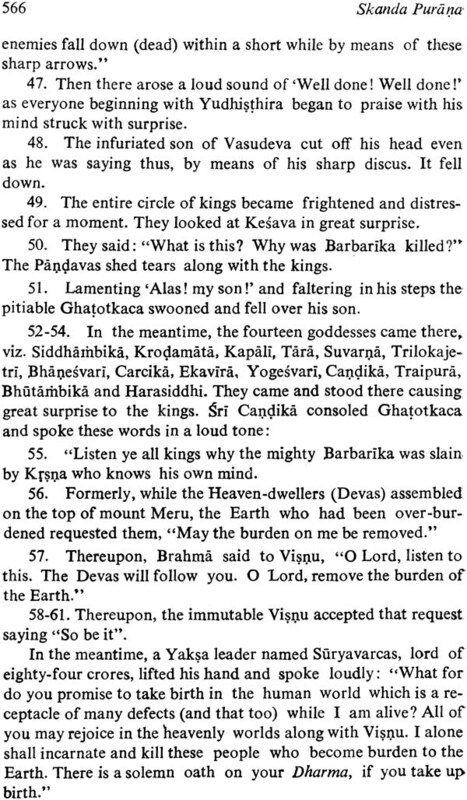 The Skp Vii states that the entire Purana was narrated formerly by Skanda to Bhrgu. 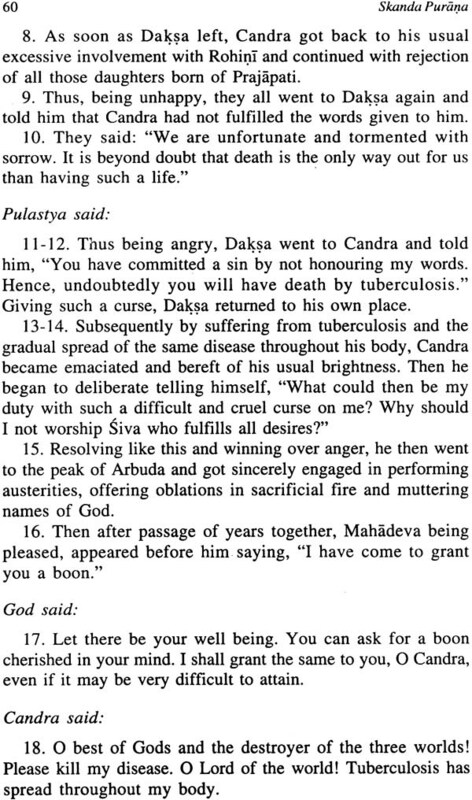 Angiras got it from Bhrgu Cyavana got it from Angiras Reika got if from Cyavana. 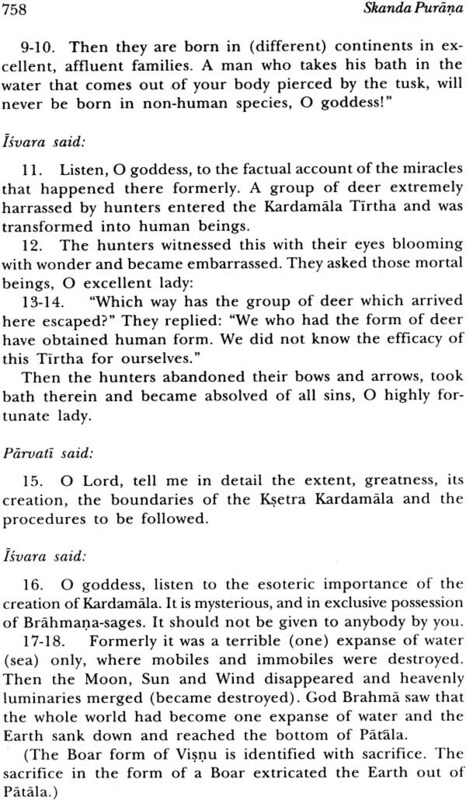 it is thus traditionally handed down. 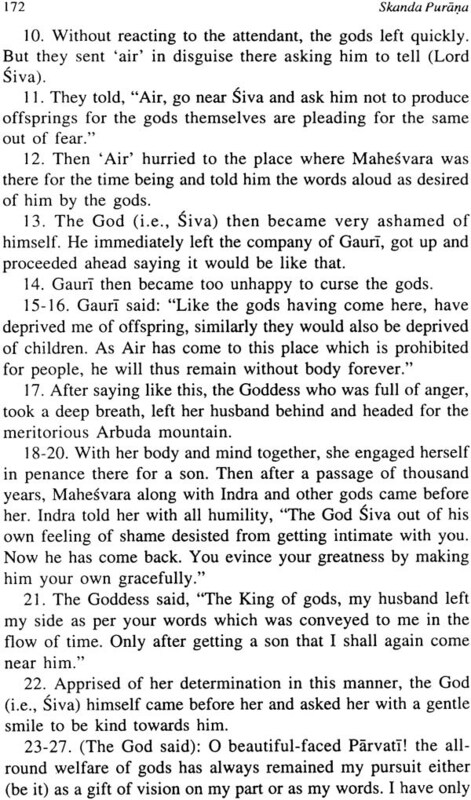 The Purana is silent as to how it came up to suta through Vyasa. 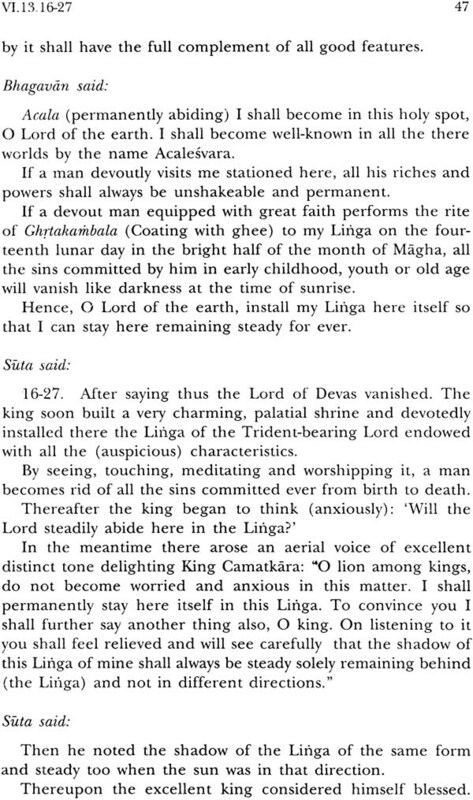 The rest of that last chapter of the Skp is Phalasruti. 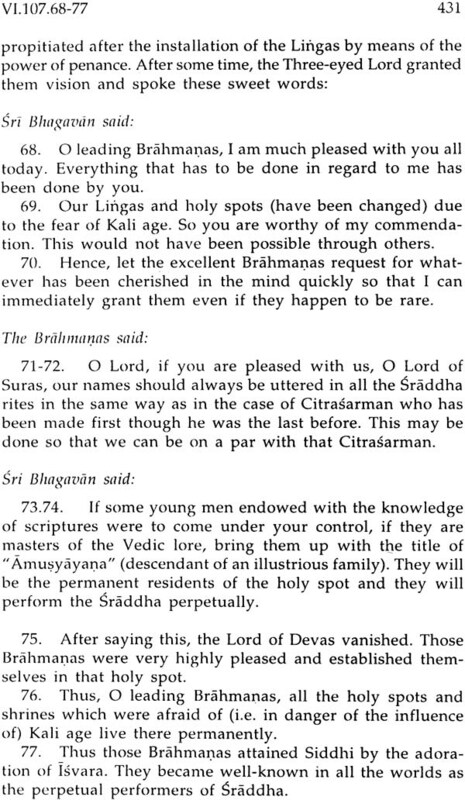 There is thus an urgent necessity of preparing a critical edition of the Skanda Purana. I have, however, followed here the VP edition. 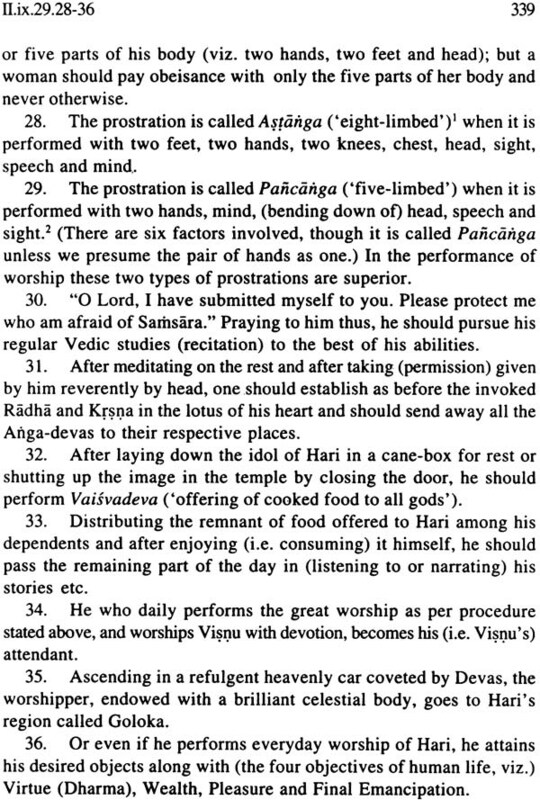 The position of the Skp as a Mahapuraa is not disputed by anyone. 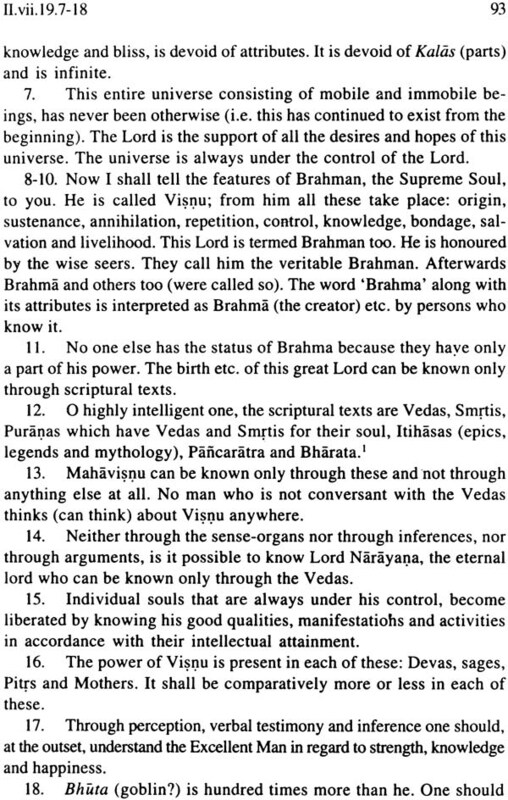 But the very nature of Sky being a library of Ksetra and other Mahatamyas, is basically different from other Puraias, say the VP or the Bhp. 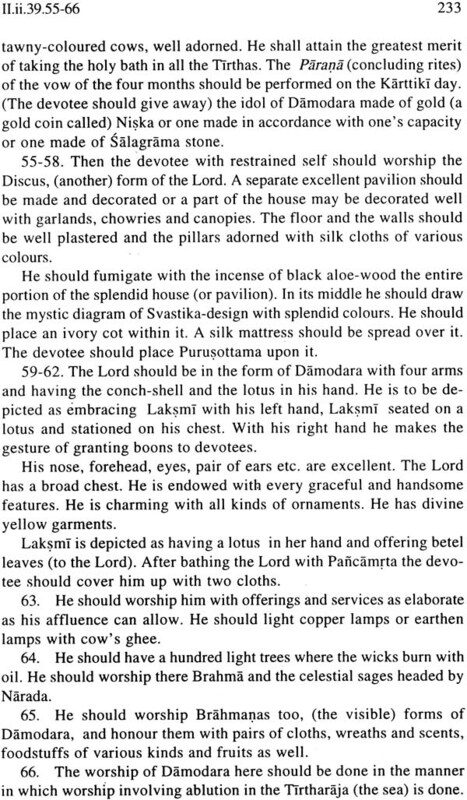 Hence we should not stretch the Sky on the Procrustean bed of puranam paica1akca- zam. 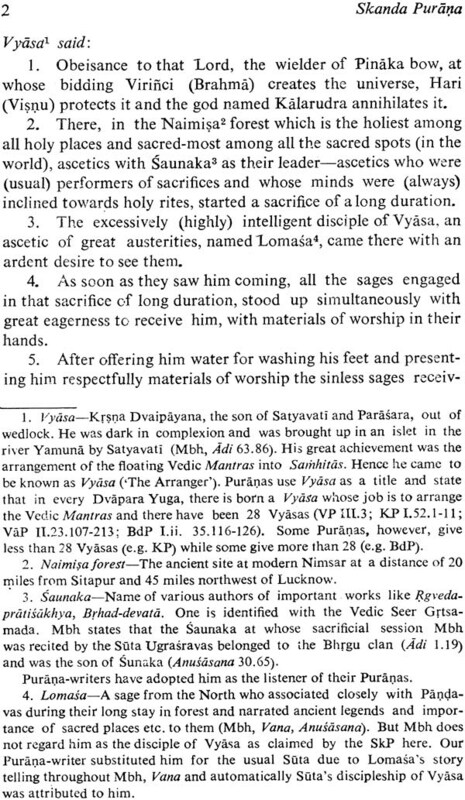 in fact (as observed by A.D. Pusalkar in Studies in Epics and Puratnas, Bharatiya Vidya Bhavan, Bombay) the paflca laksatzas are observed in their breach by a number of Puranas except the VP. 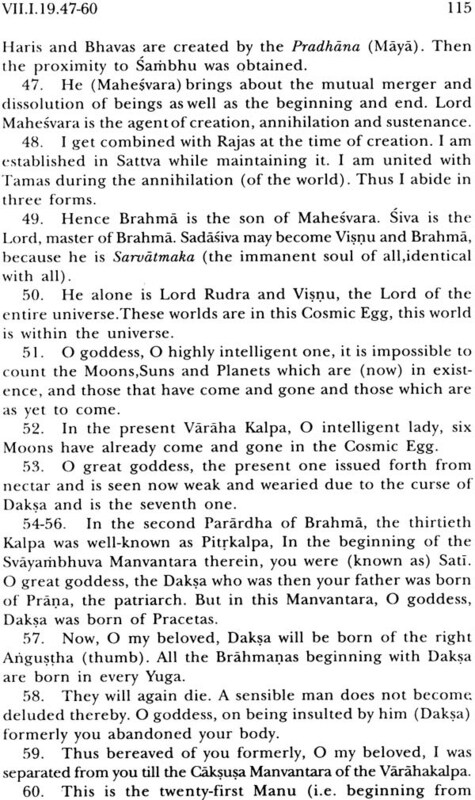 The Sky not being one book, is not expected to follow the five laksanas. 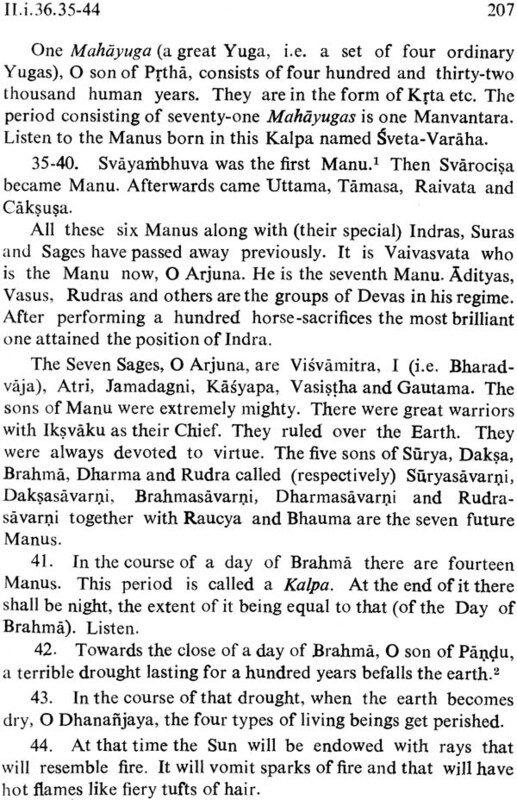 it is true that many books in the Sky share the Puranic ideas about Sarga, Pratisarga, Manvantara, but the lakksanas Vamsa and Vansabycarita are totally absent except a few unconnected semi-historical references in the Kaumarikaichanda and Brahmakhanda (see infra, the section on "Semi-historical References in the Skanda Puraa"). 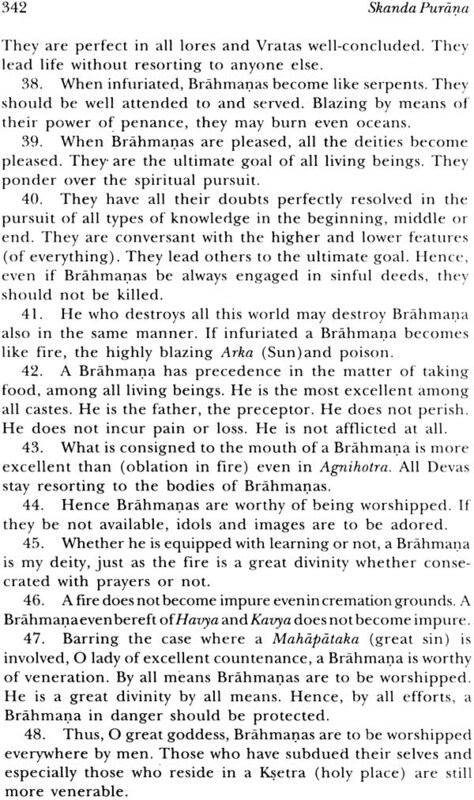 As society in Puranic india is of utmost importance and interest, let us first see society as depicted in the Sky. 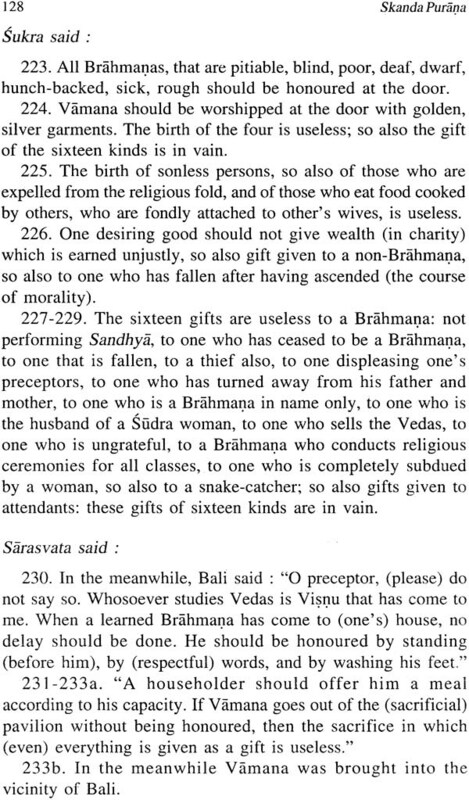 Like other Puranas, the Sky nostalgically remembers the ideal social condition in the Krta Age-a classless society, free provision of shelter, food, clothes and ornaments by trees, absence of the concept of Adharma etc. 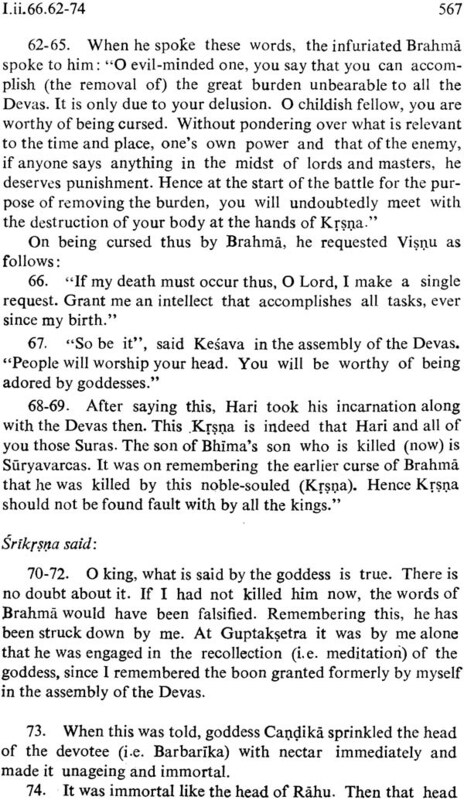 the evolution of varnas like Ksatriyas and the introduction of the performance of sacrifices appeared in treta Yuga. But as P.V. 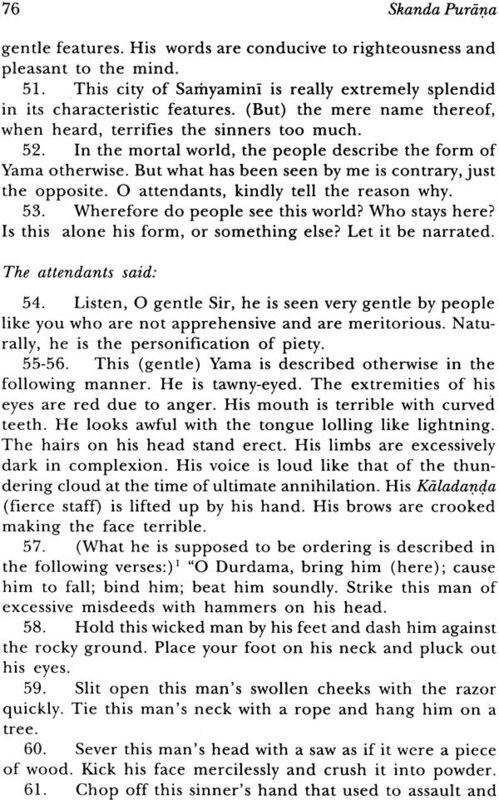 Kane Points out Varna is not jati or caste Jati has the following characteristics. 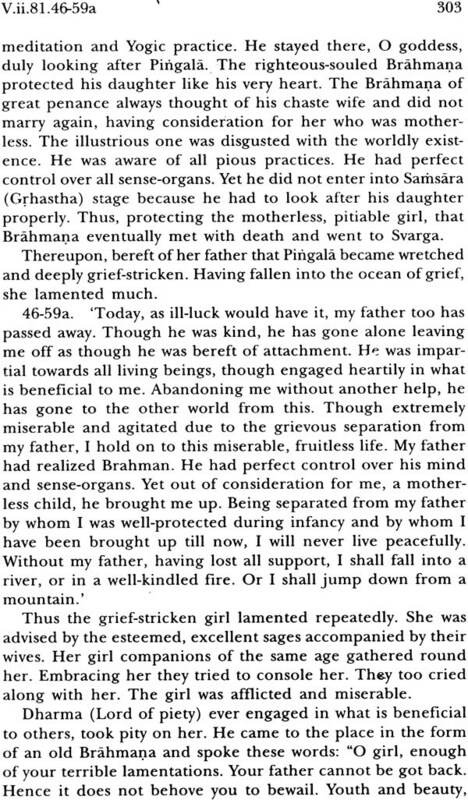 (4) Occupation A particular caste is to follow a particular occupation. 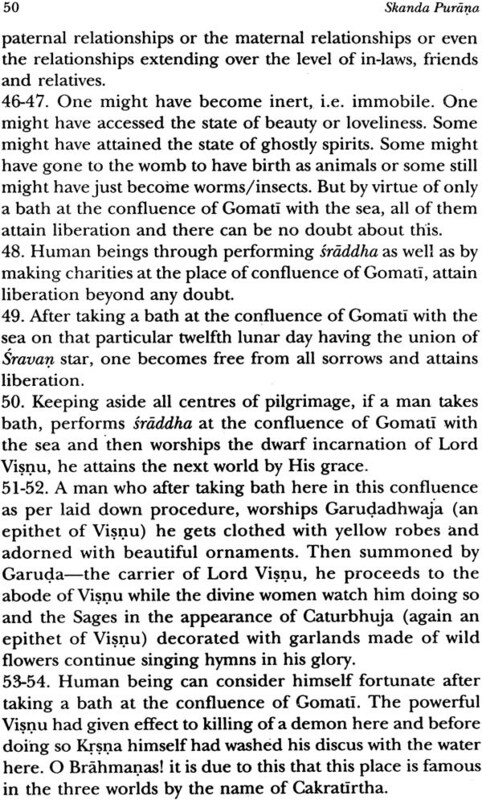 (5) Gradation of castes on a social scale jati thus lays special emphasis on birth or heredity, while Varna emphasized duties. 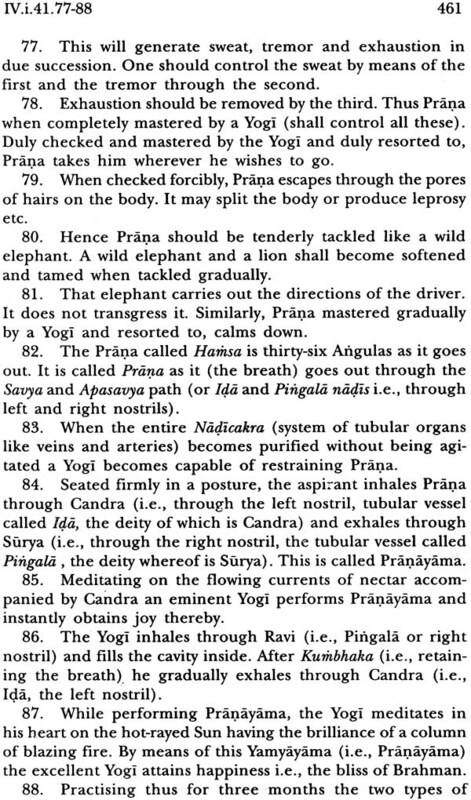 But Brahmana ksatriya vaisaya and sudra are equally important parts of the body of the Purusa. 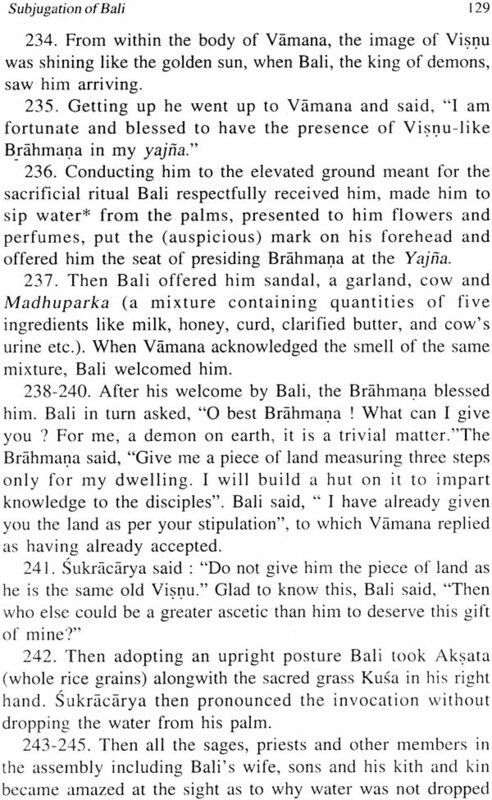 it thus represents the organic nature of the Hindu Society. 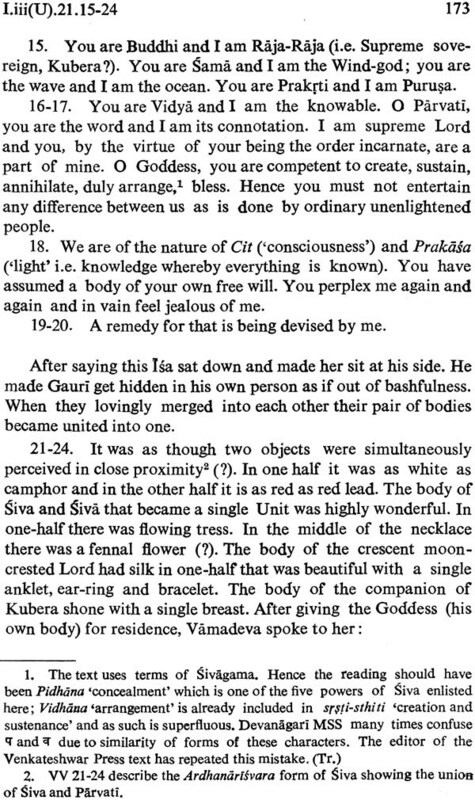 The Skp strongly asserts equality between man and man. 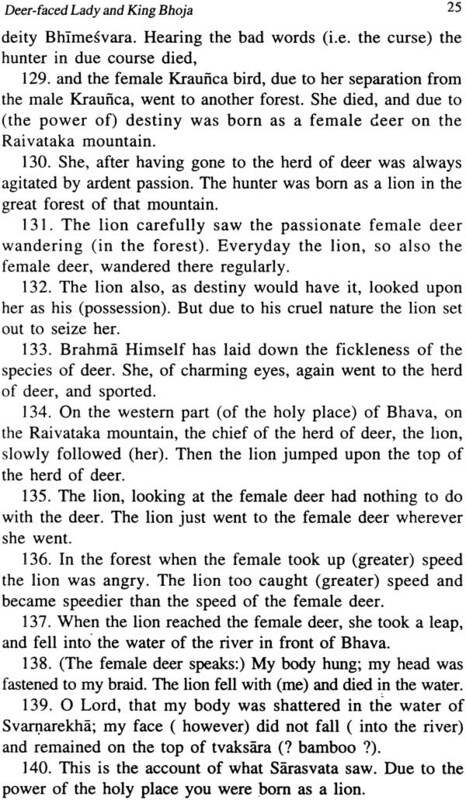 Humanity being the common factor who is low and who is high? 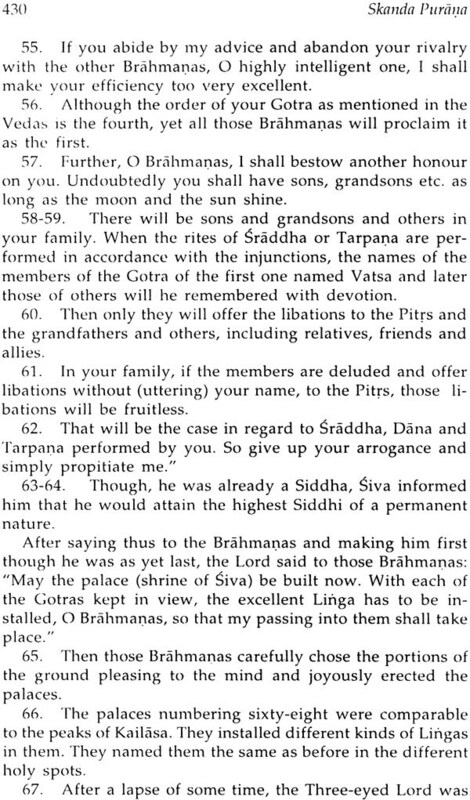 Asks Skp iV if four sons are born from the same person from the same woman how can they belong to four different varpas. 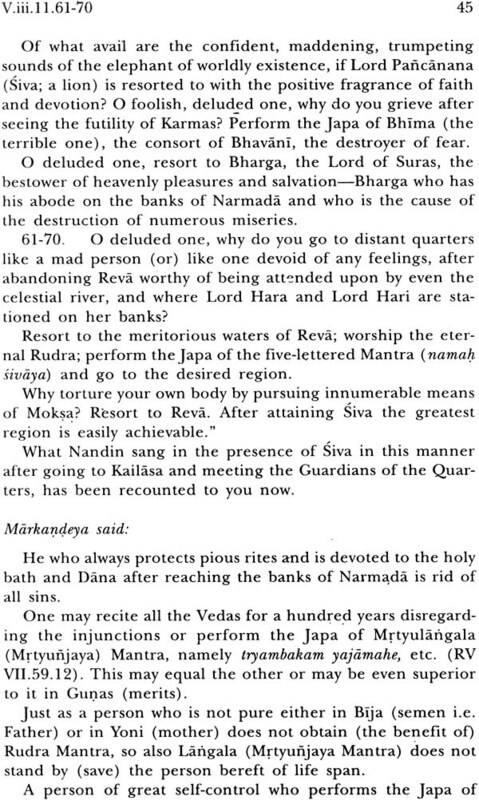 The distinction between one varna and another does not hold water. 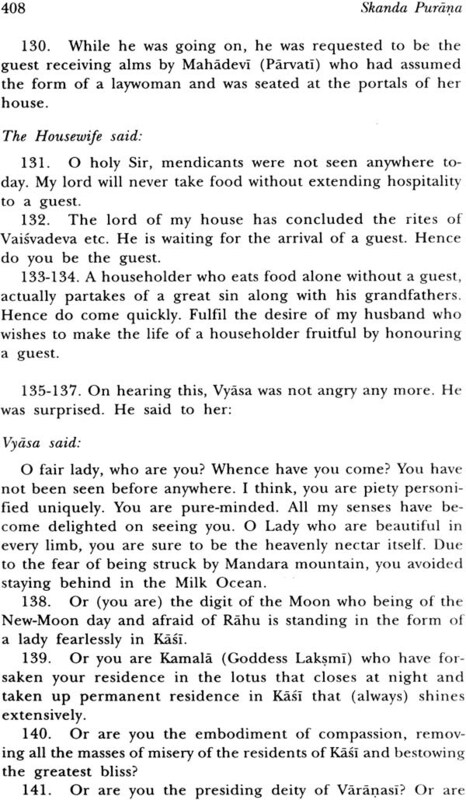 Hence nobody should every regard that there is difference between man and man like Sankara Vedanta the Skp also espoused elsewhere the stand of equality. 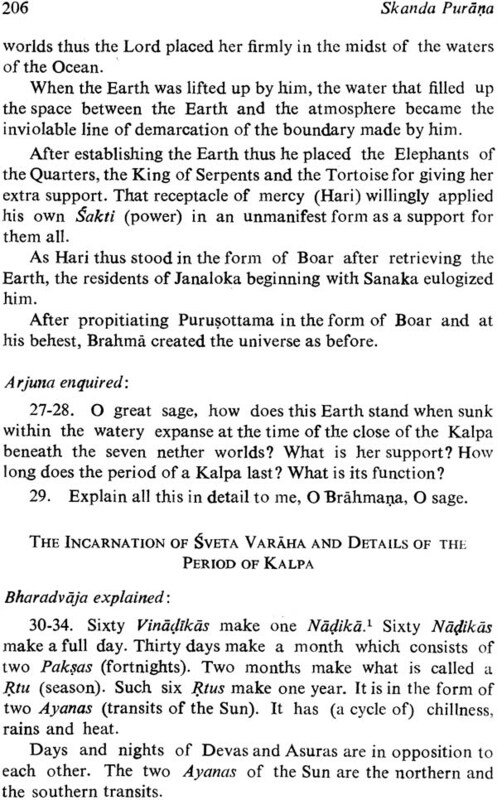 Listing the created castes god Brahmi asserts the equality of these casters to Narada all those subjects are born from parts of my body and hence are equal. 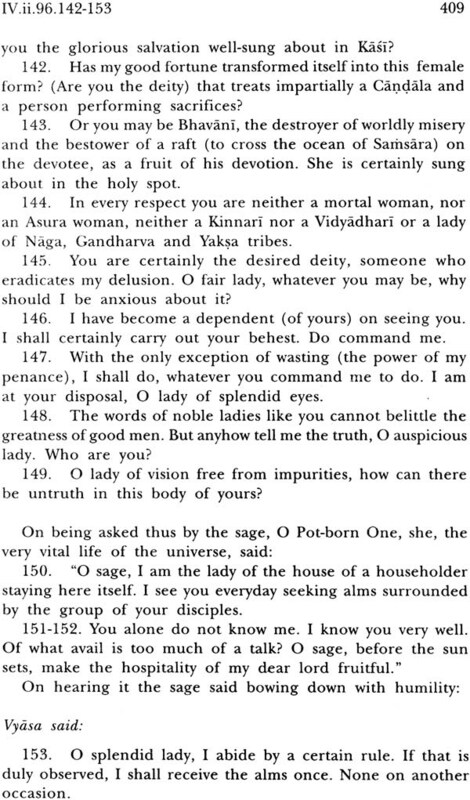 This equality is voiced in other Puranas as well e.g. 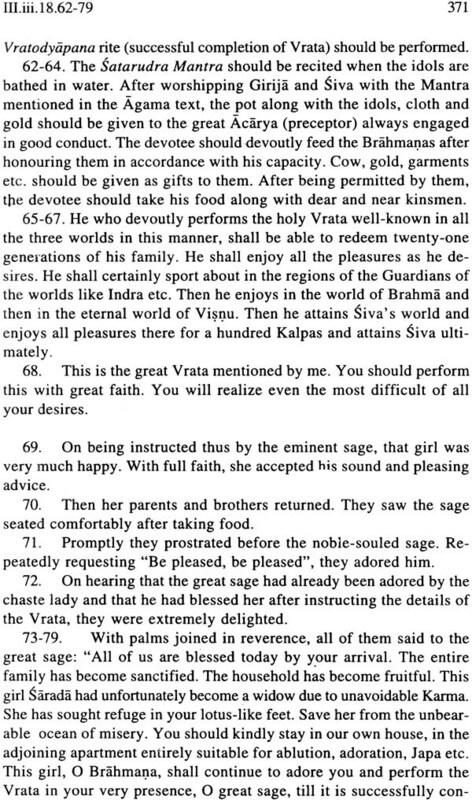 all varnas are born of the person the respetive duties of Brahamanas Ksatriyas, vaisyas and Sutras are based on old Smrtis like Manu Yajnavalkya. 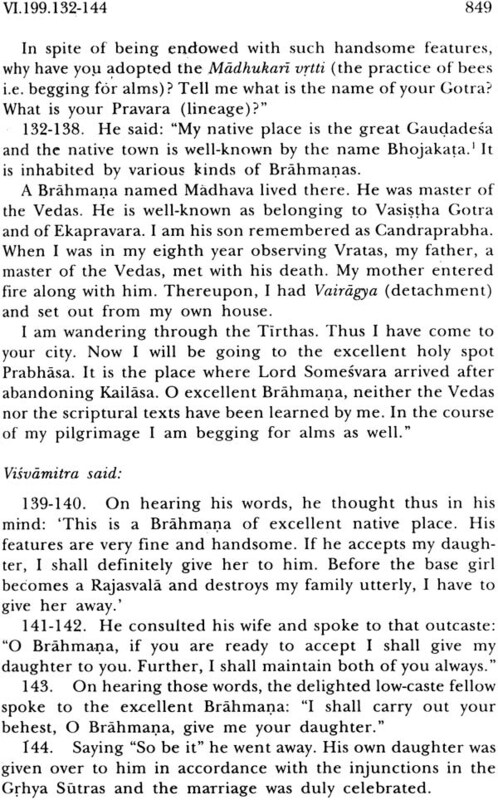 But even brahamanas took to different vocations like agriculture medical profession begging at forbidden houses and became degraded. 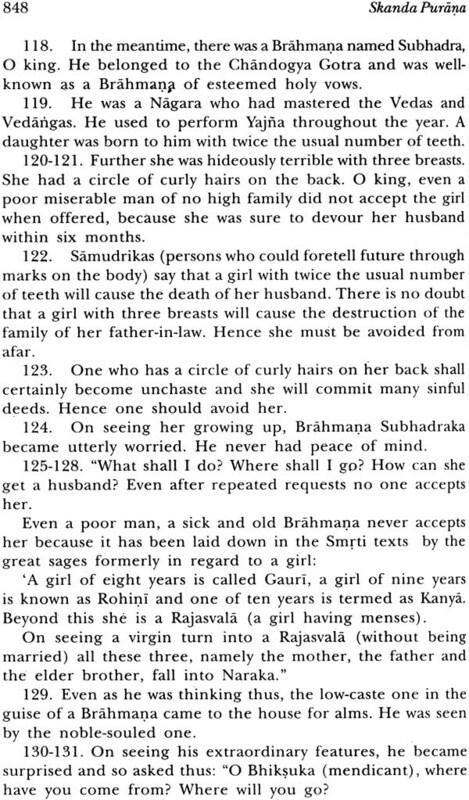 it resulted in the creation of eleven castes among brahmanas who neither dine dor marry inter. 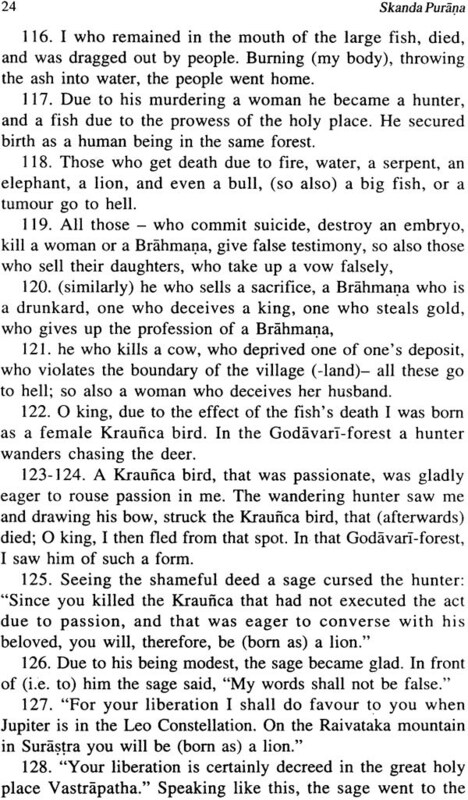 I need to learn more about my Own Religion.